Welcome to the 9th issue of AyrtonLIVE, bringing you all the latest news and developments, hot off the press. We start by bringing you nine new products which really drew the crowds when they were launched at this year’s Prolight + Sound, Frankfurt. These are previewed on pages 8-11 and introduce several exciting technological breakthroughs: the new XT™ Series encompasses our extraordinary new, ultra-narrow 126mm beam optics; the addition of new zoom fixtures, such as MagicPanel™FX, MagicBlade™SX and MagicDot™SX, complements their respective families of fixtures and offer even greater versatility to lighting designers all over the world. We are excited to introduce the world’s first laser-source, multifunctional spot moving-head, DreamSpot™18K. Lighting designers have been anticipating a profile fixture from Ayrton for a long time, but were expecting our first to be based on LED technology. We have surprised them with a totally new departure from the rest of the market. You can find out more about it on page 8. 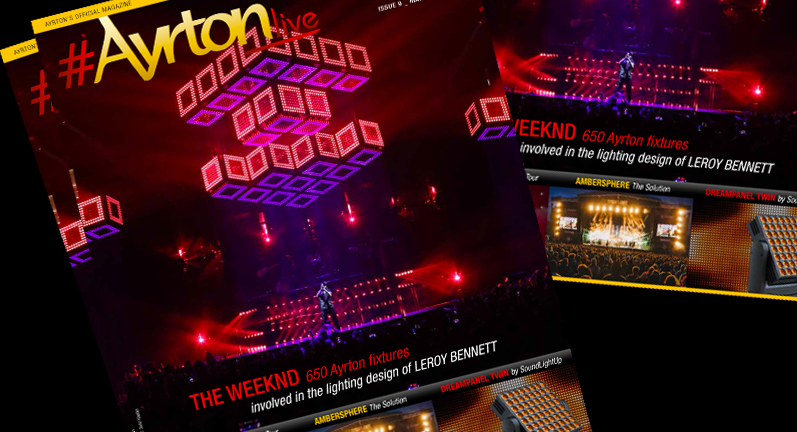 In our show reports, we bring you stories of tours from Halsey, Andreas Bourani and Johnny Hallyday, with a special focus on LeRoy Bennett’s amazing work for The Weeknd’s Madness tour which incorporated a staggering 650 Ayrton fixtures. Our installation news covers the newly relocated Queen Club in Paris and the Béjart Ballet Lausanne which have both chosen Ayrton fixtures to further their advancements in the adoption of LED lighting. In this issue’s company profile, we visit our UK distributor, Ambersphere Solutions, and invite you to learn more about the company which has quickly become such a great addition to the Ayrton family. Finally, our bench test takes you on a journey to dreamland with our DreamPanel™Twin which has given lighting designers a totally new way of creatively combining lighting and video in one extremely versatile fixture.